Maritime Antiques Inc. is the parent company of the internet auction service SOLD BUY US. 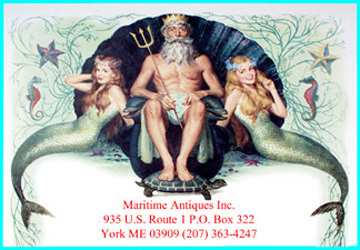 Maritime Antiques was established in 1975 buying and selling antiques at auction and at a retail level maintaining a storefront and at selected antique shows and like venues. Personally I began this endevor in 1959. While living in Bath Maine I purchased a few interesting items at bargain prices (at today's values, not then)and so goes the story. I have been an antique dealer and an auctioneer so I am quite familiar with both ends of the business. I enrolled with ebay as one of their first 5000 members and have seen this incredible meger notion grow from its infantcy to the mega conglomorate of today. Unfortunately ebay has forgotten its grass roots beginning and has been more interested in buying, selling, renting, leasing, giving away etc. etce. etc. Sold Buy Us is NOT interested in competeing with ebay, we are simply trying to offer a simple alternative with a more personal touch and at this time services at no cost to our users. Sold Buy Us may not be for every one. We are only interested in the antiques and collectibles fields and dealers and collectors. We can implement as many categories as needed with sub catagories as well. Your favorite category not listed, send us an email. Thank you.